Citation: C N Trueman "Spitfire Marks"
After the development of the first Spitfire, the aircraft underwent a number of major improvements, or marks, so that by the end of World War Two, the Spitfire Mark XIX was a very different proposition to the aircraft that had first entered service. The first aircraft that can be classed as a Spitfire was the prototype – K5054, which first flew in July 1934. Only one was built. By June 1936 the Spitfire Mark 1 was in testing – it was this aircraft, along with theHurricane, that fought in the early days of theBattle of Britain. Total built = 1. In testing July 1934. Engine = Rolls-Royce Merlin C liquid-cooled 27 litre V12; maximum power = 900 hp; maximum speed = 349 mph at 16,800 feet; service ceiling = 34,500 feet; rate of climb = 1,770 feet per minute; armament = 8 x .303 Browning Mark II machine guns. Toatl built = 1,577. In service from June 1936 to August 1940. Engine = Rolls-Royce Merlin II or III; maximum power = 1,030 hp; maximum speed = 362 mph at 18,500 feet; service ceiling = 34,500 feet; rate of climb = 2,195 feet per minute; armament = 8 x .303 Browning Mark II machine guns (Mark 1A) or 4 x .303 Mark II machine guns and 2 x 20.mm Hispano cannon. Total built = 920. First flew in 1939. The Mark II was very similar to the Mark 1 with a few modifications. 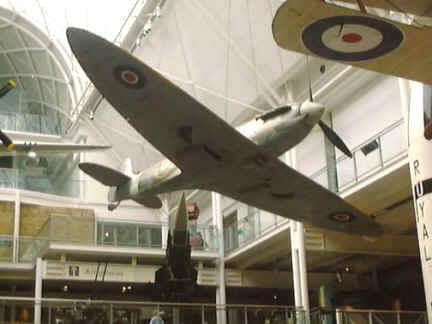 The Mark III was a complete reworking of the Spitfire. It made its maiden flight on August 15th 1940. The N3297 had a top speed of 400 mph but it was unpopular with test pilots and all orders were cancelled before full-scale production began. This was the first prototype with a Griffon engine. It had a top speed of 470 mph and was armed with 6 x 20mm cannon. It first flew on November 27th 1941. The Mark IV later became the Mark XII. The Spitfire PR IV was the first photoreconnaissance Spitfire. Powered by a Merlin engine, it was stripped of anything that was considered to be excess weight – including weaponry – but carried an extra fuel load (up to a maximum of 247 gallons) and either one or two cameras. The Mark V first flew in August 1939 and is arguably the most famous of all Spitfires. Total built = 6,787. In service from August 1939 to October 1941. Engine = Rolls-Royce Merlin 45, 45M, 46, 50, 50M + 56; maximum power = 1,440 to 1,470hp; maximum speed = 371 mph at 20,000 feet; service ceiling = 37,500 feet; rate of climb = 2,440 feet per minute; armament = 4 x .303 Browning Mark II machine guns and 2 x 20.mm Hispano cannon. The Mark VI was a high-altitude interceptor with a pressurised cabin, elongated wings and a ceiling of 39,000 feet. It was designed to combat the new generation of high-altitude German bombers that had been developed. As this threat never occurred, the Mark VI was primarily used as a trainer. This was a version built around the Mark VI. It had a maximum ceiling of 43,000 feet. Its 1,710-hp Merlin engine gave it a maximum speed of 408 mph. The Mark VIII was built as an all-round interceptor. The Mark VIII saw service in the Mediterranean and Far East conflicts. A few Mark VIII’s (6) were fitted with a Griffon engine and were used as prototypes for the Mark XIV. A version of the Mark VIII became a two-seater trainer. This Spitfire was an advanced version of the photoreconnaissance Spitfire. 70 were built in 1942. First flew October 1941. Total built = 5,665. Engine = Rolls-Royce Merlin 61, 63, 65A or 66; maximum power = 1,475 to 1,650hp; maximum speed = 408 mph at 25,000 feet; service ceiling = 43,000 feet; rate of climb = 3,950 feet per minute; armament = 4 x .303 Browning Mark II machine guns and 2 x 20.mm Hispano cannon. First flew May 1942. Total built = 16. This was an unarmed photoreconnaissance aircraft, which was pressurised. A retractable tail-wheel aided streamlining and reduced fuel consumption. The Mark XI became the RAF’s principal photoreconnaissance aircraft in the later stages of World War Two. It had a specially smoothed airframe that gave a top speed of 417 mph at 24,200 feet. On April 27th 1944, a Mark XI flew at Mach 0.89 in a dive. First flew in August 1941. Total built = 100. The Mark XII was the first Griffon engine powered Spitfire to enter service with the RAF. It was used as a low-level interceptor and was especially successful against V1’s. First flew in August 1942. Total built = 26. The Mark XIII was a low-level photoreconnaissance aircraft and later flew with the Fleet Air Arm. First flew in July 1942. Total built = 957. Engine = Rolls-Royce Griffon 65 37-litre liquid cooled V12; maximum power = 2,035; maximum speed = 439 mph at 24,500 feet; service ceiling = 43,000 feet; rate of climb = 4,580 feet per minute; armament = 4 x .303 Browning Mark II machine guns and 2 x 20.mm Hispano cannon. The Mark XVI was essentially a low-level interceptor of the Mark IX powered by a Packard-built 1,580 hp Merlin 266. Maximum speed = 437 mph. Saw service in the Far East but right towards the end of World War Two. Flown during the 1948 Arab-Israeli War. First flew in June 1943. Total built = 225. A photoreconnaissance aircraft powered by a Griffon engine. The XIX had a top speed of 460 mph and it was the last Spitfire Mark to be flown in the RAF. The F 20 was a prototype for a number of future F versions all powered by a Griffon engine. This version was so troubled that the Air Ministry made it clear that they believed that the Spitfire had reached the end of the line with regards to production. All 121 aircraft were powered by a Griffon engine but some were fitted with contra-rotating six-bladed propellers. First flew in June 1942. Total built = 264. This was the successful version of the F 21. It entered service with the RAF in 1946 and flew until 1955. Capable of 449 mph at 25,000 feet. However, jet technology had taken over and the days of propeller-powered fighters were all but over. One F 23 was built. First flew in June 1943. Total built = 78. Engine = Rolls-Royce Griffon 61, 64 or 85; maximum power = 2,340 hp; maximum speed = 454 mph at 26,000 feet; service ceiling = 43,000 feet; rate of climb = 4,100 feet per minute; armament = 4 x 20.mm Hispano Mk II cannon plus under wing-mounted rockets.